Well let me tell you that trees are amazing, and I mean, we literally breath the air they are creating, and they clean up our pollution, our carbon, store and purify water, give us medicine that cures ours diseases, food that feeds us. Which is why I am so sorry, to tell you that, we burned them down. Cut them down with brutal machines, horrific, at a rate of 40 football fields every minute, that's 50% of all the trees in the world all gone in the last 100 years. Forest growth nationally has exceeded harvest since the 1940s. By 1997 forest growth exceeded harvest by 42 percent and the volume of forest growth was 380 percent greater than it had been in 1920. Mother Nature Network analyzed the report and concluded that there were more trees than there were 100 years ago. Did 50% of the world's trees perish in the last 100 years? Forests currently cover about 4 billion hectares, about 31 percent of the earth’s land surface (FAO, 2010b). 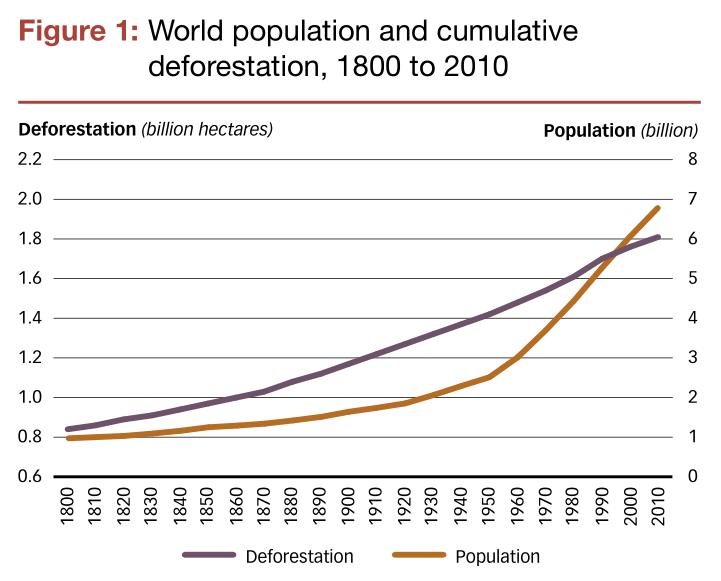 As can be seen in the graph, roughly 0.6 billion hectares of forest has been lost over the past century, from 1900 (1.2 billion hectares lost) to 2010 (1.8 billion hectares lost). Therefore, the total forest cover has decreased by approximately 13% in the past century, which hardly reaches the level claimed. Unless the forests cut down are almost 4 times denser per unit area than the average forest, it is also unlikely that half of the total number of trees was cut down. Not the answer you're looking for? Browse other questions tagged plants .